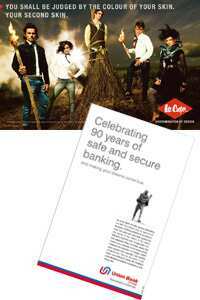 Value proposition: Lee Cooper India is celebrating its centenary year in ads, while Union Bank of India decided to combine its rebranding exercise with its 90th year celebrations. Mumbai: Celebrating 90 years of safe and secure banking," says a print ad for Union Bank of India, or UBI. The public sector bank recently undertook a Rs75 crore rebranding exercise which, along with a new logo and tag line, emphasized the legacy of a bank whose registered office was inaugurated by Mahatma Gandhi nine decades ago. While this is not a new phenomenon among financial and luxury goods advertisers which can benefit from brand values such as trust, stability, heritage and lineage, advertisers in businesses such as automobile, consulting, consumer products and apparel are also now talking about their age. There is also a rise in the number of advertisers across product categories using this as a strategic point in their campaigns to remind customers about their track records. Hero Honda Motors Ltd has launched a campaign to celebrate its 25th year of existence and Korean car maker Hyundai Motor Co. features a “10 years of driving India" seal in all its ads. An ad for Capgemini, a company which is into consulting, technology and outsourcing, emphasizes its 40-year existence and Lee Cooper India Pvt. Ltd is celebrating its centenary year in ads. Even consumer goods maker Hindustan Unilever Ltd shows a “75 years" seal in its ads. According to experts, there are a few situations in which the age of the brand or company can be a valuable proposition. In the first, it can be used as a tactical tool, an opportunity to indicate some new direction the brand or company wishes to take, says Anand Halve, co-founder, Chlorophyll Brand and Communications Consultancy Pvt. Ltd.
“At best, it’s an act of reassurance, a surrogate for trust," says Santosh Desai, managing director and CEO, Future Brands, a brand consultancy from the Future Group. That’s what UBI did when it combined its rebranding exercise with its 90th year celebrations. “People are looking for safe and sound banking avenues for investment after witnessing the upheaval of financial sectors across the world," says S. Govindan, general manager—personal banking and operations, UBI. “Large banks across the world have fallen… so, in that sense, it was a good time to emphasize this," he says. A number of brands in the financial sector have gone all out to use the age factor as a way of establishing credibility and trust in this environment. An ad for DSP BlackRock Mutual Fund (earlier DSP Merrill Lynch) underlines its association with DSP Group Inc., with a “track record of 140 years". In other cases, the anniversary route can be used to highlight a more long-term initiative. It can use the age landmark as a springboard for change where it ventures into newer business areas, launches new products or services, among others. This can also be used to launch significant changes internally, such as corporate restructuring to create a new cadre of leadership, among other things, say experts. “This campaign is a celebration of our centennial year, with the intention of informing the audience and creating the Lee Cooper clan—a group of Lee Cooper loyalists created on the basis of attitude and style," says a Lee Cooper spokesperson about ads celebrating the apparel brand’s 100-year-old lineage. According to Desai, a category dominated by new players can also stress on the age factor. So, if a car company is celebrating 25 years in India, this can be highlighted through promotions which offer Rs25,000 discount on every purchase or 25 gifts on the purchase of a car. However, more often than not, when a company reaches a milestone it becomes a bit of a ritualistic habit where “something has to be done to mark the occasion," warns Desai. Pedigree or heritage can be leveraged at the launch of a new product but the product category and market situation needs to lend itself to the idea. “If a company promotes themselves as a make of chewing gum since 1956…who cares?" says Halve. Ditto for financial services that could face a backlash on their brand. “If DSP Merrill Lynch says they (have) been around for X amount of years, well, so were the Lehman Brothers, and they just dropped dead," he says. “Reminding consumers about your geriatric condition is not a good thing during a crisis situation."